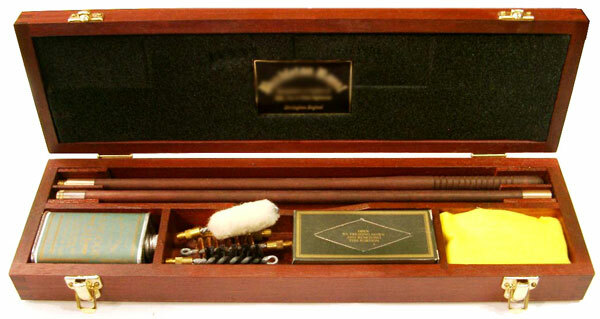 MAHOGANY CASE WITH SEPARATE COMPARTMENTS CONTAINING A TWO PART CLEANING ROD, 4.4 FL.OZ. CAN OF OIL, BRISTLE BRUSH, BRONZE BRUSH, WOOL MOP, BRASS JAG, SHOTGUN CLEANING PATCHES AND A FLANNEL DUSTER. SIZE 18 1/4" X 4 3/4" X 3"